Book Drunk: Reviewed: Greedily Yours: Episode 1: Taste Test by Emma Hamilton. 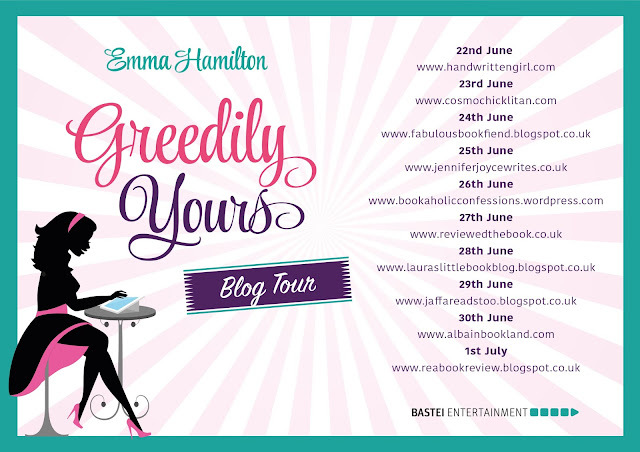 Reviewed: Greedily Yours: Episode 1: Taste Test by Emma Hamilton. Greedily Yours: Taste Test is episode one in an eight part novella series published every Monday and Thursday. It was published by Bastei Entertainment on June 15, 2015. Thanks to Hayley at edPR for sending me a copy of this book to review for the blog tour. Taste Test is episode one of the eight part serialisation of the Greedily Yours novel. It was an enticing, intriguing opener and one which makes me hungry just thinking about it. 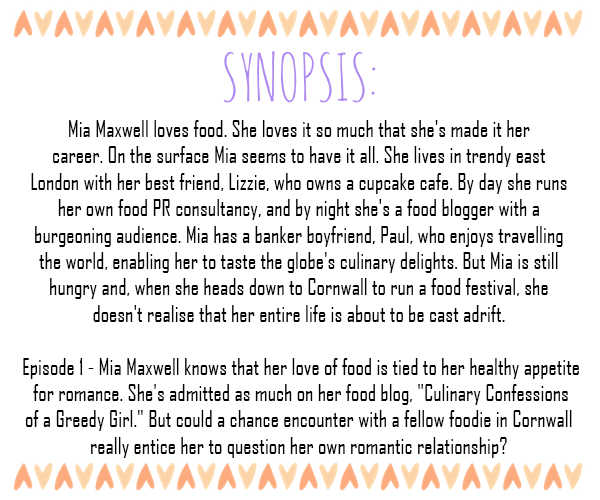 Mia is a food blogger who also spends her time organising food festivals and this instalment sees her head to the festival in Cornwall – which even getting there was less than straightforward. I liked Mia, I found her quite amusing and liked how she could laugh at herself but then quite feistily stand up for herself too. At times I felt like she moped a bit too much – she does love a good moan – but I think she’s a character I’ll find easy to root for as the series goes on. Taste Test started off very slowly and it did take me a bit of time to fully connect with the story. At the beginning, we learn a lot about Mia’s relationship with her boyfriend Paul and it’s very obvious that she’s not too happy with him, even when she tries to make excuses for that. The first quarter or so of the book is a lot of Mia thinking about things that have happened with her and Paul and complaining about him which did slow the book down and whilst I think it’s setting the reader up well for events further on in the series, I kind of found myself wanting her to ditch him – and fast. Having said that, I found this to be a real easy, escapist read and I enjoyed it much more as I went on. I loved the parts where we get to see both Mia and her best friend Lizzie together because they are a bundle of laughs and seem, at first glances, to have a pretty honest and forthright friendship which I think will probably play a part considering Mia kind of needs a bit of a pep talk and relationship guidance, in my eyes anyway. Lizzie runs her own cupcake business and those cupcakes sounded heavenly! Mia also can’t resist them which she’s not overly impressed with considering she’s wanting to lose weight. I think personally the cupcakes sounded worth every calorie! I really liked Lizzie and I hope we see a lot more of her in future instalments. There’s a lot more going on in Taste Test than I will mention – because it’s all in the fun of reading it yourself but I did enjoy the surprising quite dramatic turn of events. That ending drew me right in – very eager to read more! This book is worth reading for Mia’s foodie blog posts alone which are refreshing to read. Her blog Culinary Confessions of a Greedy Girl is the kind of uplifting blog with delectable food that would have me drooling over it in real life if it really existed (I wish it did). There are also a set of yummy recipes at the end of the book to whet your appetite, if the scrummy descriptive writing all throughout the episode wasn’t already enough to have you reaching for a cupcake or six. A witty, entertaining start to the Greedily Yours serialisation, with torturous divine foodie descriptions. Mia's Rye bread sandwiches recipe! I love tangy and tasty combinations, this is one of my favourites for a quick lunch at home when you’ve got left over jars of pesto or mayo. Slice the bread, four slices at least, go on, be naughty. Spread one slice of the sandwich with pesto and the other with mayo. Slice your red onion thinly, slice the goats cheese if it’s hard or spread it if it’s soft over the bread. Lay the red onion on top of that and sandwich together. Bite into it. Yummy, Lizzie and Mia love these kinds of treats after their meetings.